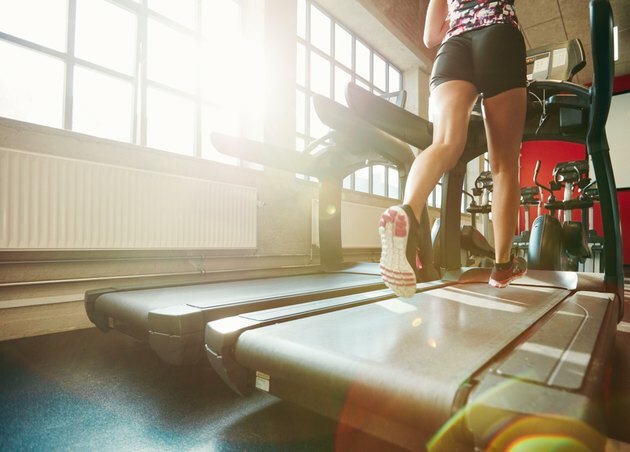 If you're working out on a treadmill primarily to lose weight, knowing how many calories you're burning can be an important factor in your workout's success. The digital readout on your treadmill may be a valuable tool in counting those calories -- but if it's inaccurate, it may have the exact opposite effect. Losing weight is a matter of establishing a negative caloric imbalance in your body. You do this by burning more calories through activity than you consume. When your body is in a state of negative caloric imbalance, it gets the extra calories by burning body fat it built earlier. This is the basic mechanic that drives exercise. When you work out on a treadmill, the exercise burns extra calories -- which can contribute to the total calorie burn that leads to a negative caloric imbalance. For a running or walking workout -- the most common kind you would do on a treadmill -- you compare your body weight to your pace to determine the calories you burn per minute, then multiply that number by the length of your workout. You can use a variety of print or online resources to look these numbers up. The digital calorie counter on your treadmill uses one of a variety of methods to determine how many calories you burned in a workout. The simplest and least expensive use your body weight and pace, just like you would using a calculator on your own. More advanced models will take readings of the incline for your workout and your heart rate. In theory, calorie counters that take in more variables can be more accurate -- assuming the counter is properly calibrated. A treadmill takes into account some factors a print or online calculator won't, but there are many other factors that can affect how many calories you burn in a workout. These include, but aren't limited to, your level of personal conditioning, how recently you ate, what you're wearing, the air temperature and even your mood. Treadmill calorie counters are no better able to account for these concerns than a calculator you find online. Accuracy is a relative concept. Assuming it's calibrated properly, a treadmill calorie counter can be more accurate than a hand calculation because it considers more significant variables. However, calorie counting includes so many variables that even a precise treadmill calorie counter is at best an approximation. You: Losing Weight; Dr. Michael Roizen, et al. How Accurate Are Treadmills on Distance? How Much Distance Equals a Mile on the Elliptical?